Choosing a vitamin for your child can help their growing bodies and brains as well as boost their immune system and fill in the gaps that they might not be receiving from their diet. Choosing an organic vitamin, on the other hand, means getting the benefits of all of the above and ensuring that the vitamin they get comes from plant based sources that have not been treated with pesticides. The vitamin and supplement market is flooded with so many pills that it’s sure to make any parent’s head spin. And we get it. So we’ve done all the hard work for you and have come up with a list of our favorite organic vitamins for kids. There’s a lot to think about before you choose a vitamin for your child, so we’ve broken down what you need to know and consider before choosing the right one. We’ll preface this all first by saying, please consult your child’s pediatrician first before starting your child any supplement or vitamin regime. Your child’s doctor knows best. Have a growth delay developmentally or physically. Have a limited or restrictive diet. If your child is a picky eater, that too may be worth considering adding a multivitamin to fill in the nutritional gaps. Note that if your child is taking medications, certain vitamins, minerals, and supplements can interact with certain medications, so check with the doctor first. As we stated before (and may do so a few times) your child’s doctor knows best, so please, check with them first. There are a few vitamins and minerals that are super important for children that some may or may not get already from their diet. Vitamin D is important for building strong bones as well as protecting against disease when they are older. Good sources of Vitamin D are fish, eggs and fortified milk. Calcium is a mineral that works with Vitamin D to build strong bones. Calcium can be gotten from milk, cheese, yogurt, and calcium-fortified juices. Vitamin B and we are talking all the Vitamin B’s (B12, B6, B3, etc.) are important for energy, circulation, and metabolism as well as the nervous. Vitamin B comes from meat, fish, milk, eggs, nuts, beans and cheese. Iron is a mineral that is crucial to keeping red blood cells healthy. It also helps kids build muscle. Your doctor can check to see if your child is deficient in iron. There is a risk of iron deficiency in older kids, especially in girls who have begun to menstruate. Iron is found in red meats as well as pork and turkey, beans, spinach, and prunes. Vitamin E is important for a healthy immune system. Vitamin E is found in nuts and seeds like almonds and sunflowers seed as well as some oils such as sunflower oil and safflower oil. Again, unless otherwise recommended by a doctor, here are some vitamins you should steer clear of for your child. Vitamin A. Many foods including milk are fortified with vitamin A, and the chances of kids having a vitamin A deficiency are low. Too much vitamin A, on the other hand, can be toxic. Magnesium. Again, the chance of magnesium deficiency is low and magnesium is easily absorbed into the system from the foods kids eat. Vitamin K. Vitamin K is found in many foods. A deficiency in vitamin K is only a problem for newborns who are breastfeeding that did not get the vitamin K shot at birth. Zinc. Zinc deficiency is rare and is found in most foods. Remember, too much of any vitamin isn’t good, but especially with the above, as they are in most children’s diets. However, if you suspect a deficiency to any of the above vitamins, talk to your child’s doctor. Most doctors agree that if a child is eating a well-balanced diet there is no need for any supplements. But if your child avoids a certain food group such as dairy or meat or has another health concern as we mentioned before, a multivitamin might help. 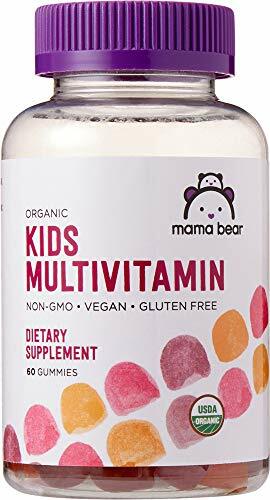 But before you grab one off the shelf, like those tasty gummy ones, here are some things you need to know when looking for a multivitamin for your child. Look for the USP symbol on the label. This ensures the supplement has been tested for quality. Check for additives, dyes or any unwanted ingredients. Some supplements add fillers, artificial dyes or even herbs that you may not know unless you check the ingredients. Check the sugar content. Of course, it makes taking the multivitamin easier if it has a little sugar in it, but try to choose a multivitamin that has 3 grams or less of sugar per serving. Check if it contains any allergens. Parents of children with allergies probably already know and frequently check food, but be sure to check supplements for potential allergies as well. Some common allergens that can be in multivitamins include dairy, soy, corn as well as others. The one downside to kids vitamins is that many are tasty. So tasty in fact that children are tempted to eat more than the serving suggestion. There is no doubt that gummy multivitamins make it easier for kids to take but can also pose a risk if children get access to them. The best way to prevent an accidental overdose of a multivitamin is to store them out of reach of children. If the vitamins contain iron, lock up vitamins if possible. It’s also a good idea to discuss with your child why taking too many vitamins can be a bad thing. GI problems. Nausea, diarrhea, and vomiting can all be signs that they ate too many vitamins. Colorful urine or stool. Too much vitamin B can mean neon yellow urine. Vitamins that contain dyes and fillers can turn up in their stool. If you think your child has ingested too much iron, call the poison control center immediately. You will most likely need to take your child to the emergency room. While most of the vitamins on this list are multivitamins, we aimed the included something for every kid, including those who are low in just one vitamin such as vitamin D and iron (though, yes we know iron is technically a mineral). And yes, we’ll say it once more— check with your child’s doctor first before starting them on any vitamin or supplement. This multitasking multivitamin not only has all the vitamins and minerals you’d expect to find in a good multi but omega 3s and probiotics too. It tastes great too which is good because kids 4 years and older can take up to 4 gummies a day. Like all Smarty Pants Organics products, these multivitamins are USDA certified organic by QAI (Quality Assurance International). It is also free of GMOs, milk, eggs, fish, shellfish, gelatin, soy peanut, wheat, and tree nuts. What kids will get is a good dose of B12 for immune function and energy, and Vitamin D3 for strong bones, as well as 12 other essential vitamins and minerals. The probiotics in this multivitamin support gut health and the Omega 3s are vegetarian since they come from flaxseed oil. Includes vegetarian-friendly Omega 3s and probiotic. Tasty cherry, mixed berry, and orange crème flavors. Non-GMO and USDA certified organic. Tad too sweet.A little high in sugar. Yummi Bears Organics knows a thing or two about gummies. They were the first ones to make gummy vitamins back in 1997. This gummy is a complete multivitamin and has 14 essential vitamins and minerals for growing bodies. This multivitamin is also allergen friendly and free of gluten, dairy, soy, yeast, salt, gelatin, egg, wheat, and peanuts. It also doesn’t contain any artificial flavors, preservatives, or dyes. Not only are the ingredients organic but non-GMO too. The sugar content is a little higher than we’d like, 5 grams, but it does come from organic cane sugar. For kids 2-4 years old, one serving will provide them with 100% of their Vitamin A, 150% of their folic acid, 200% of their daily Vitamin E, 167% of their daily Vitamin B12 and more. Yes, Amazon’s very own brand of organic multivitamins not only taste great but are easy on the wallet. These USDA certified organic gummies are not only vegan-friendly and gluten-free but naturally fruit flavored. Even with only 3 grams of sugar, kids love the fruit taste. Packed with Vitamin D, B6 and E, these gummies have all the vitamins and minerals to help kids meet their daily requirements. And though they taste great, extra young kiddos might have a hard time chewing these gummies. They are a little on the larger side, compared to other multivitamin gummies on this list. Large in size. Younger kids might have a little difficulty chewing. 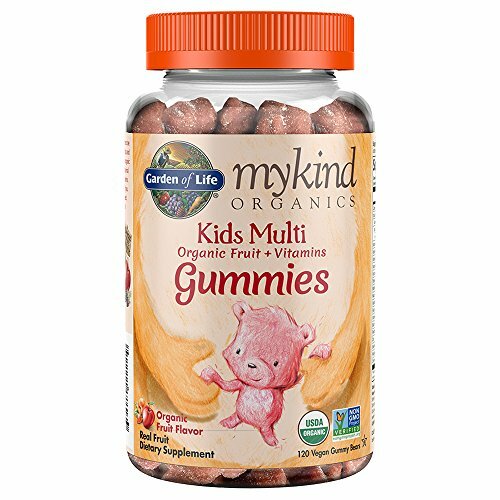 Nine organic whole fruits go into one bottle of Garden of Life mykind Organics Kids Multi Gummy! What doesn’t go in are any artificial colors, flavors or preservatives. And not only is it certified organic, but it’s also certified vegan, kosher and gluten-free. Kids like the natural fruit and cherry flavors. These gelatin-free gummies are made from fruit pectin from apples and orange peel. For kids with allergies, this one is nut-free, soy-free and dairy-free. Again, this is another one that kids will have no problem taking, as they can take up to 4 a day. And while most kids enjoyed the taste, some noticed that the smell was less than pleasant. So perhaps keep their nose out of the jar. All natural flavors and colors. Certified vegan, kosher and gluten-free. 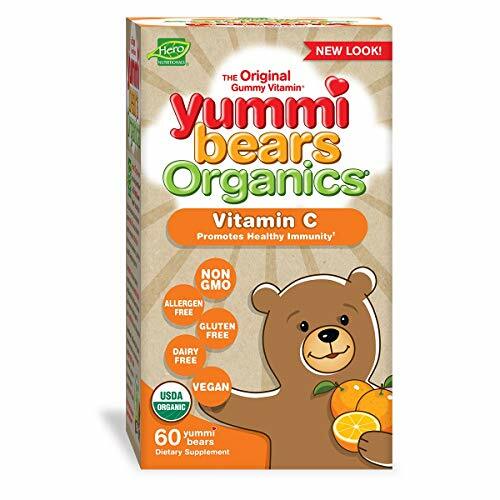 Here’s another one from Yummi Bears Organics, but this one is just good ole fashion Vitamin C to help boost kids’ immune systems. Just 2 bears will give kids 150% of their daily value of vitamin C, so definitely grab a bottle or two to help get them through cold and flu season. 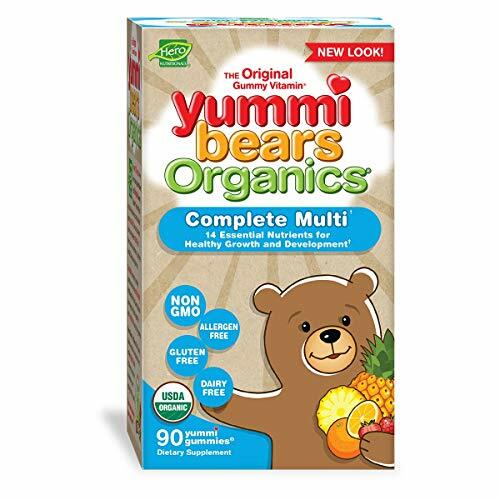 Like Yummi Bear multi, these tasty vitamin C gummies are allergen-friendly, gluten-free and vegan. Two gummy bears contain 4 grams of sugar and are naturally colored with pumpkin, carrot and apple juice. A little high in sugar. If its cold and flu season, there’s no doubt that your child’s immune system could use a boost. And that all starts in the gut. 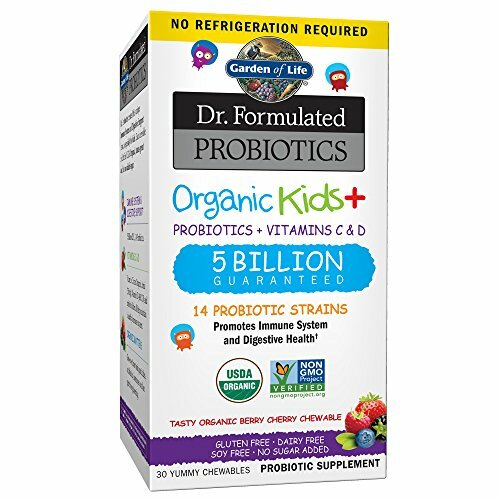 This probiotic supplement with vitamin C & D3 gives your kids the immune system boost they need as well as a happy healthy belly. With 5 billion CFUs, this probiotic contains 14 different probiotic strains. These chewables are naturally sweetened and come in a tasty cherry berry flavor. One chewable contains 33% of kids daily Vitamin C and 50% of kids daily Vitamin D3. Helps immune and gut health. Some kids weren’t fond of the taste. For strong, healthy bones and teeth, calcium and vitamin D3 are the way to go. 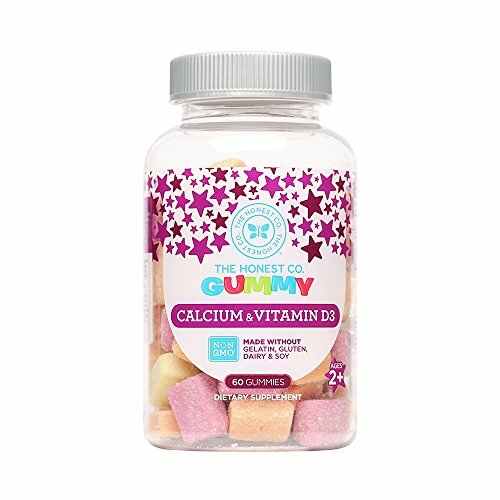 The Honest Co. Gummy Calcium & D3 isn’t 100% organic but contains 78% organic ingredients that are certified by the USDA. One bottle will come with strawberry, orange and banana flavors, all naturally flavored with real fruit. This gummy is also vegetarian-friendly and made with fruit pectin instead of gelatin. This calcium & vitamin D3 supplement is free of gluten, dairy, soy, and high fructose corn syrup as well as artificial sweeteners. The sugar content is a little high, 5 grams for 2 gummies, but it is sweetened with organic sugar and organic tapioca syrup. Natural fruit flavors taste great. No artificial colors, preservatives, or sweeteners. That’s right. A multivitamin with omega 3 and probiotic just for the extra small guys and gals. 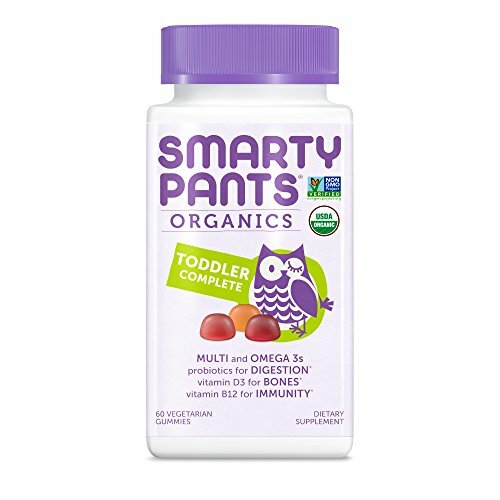 It has everything our #1 Smarty Pants Organics pick has, but this one is specially made and dosed for toddlers. For kids 2-3 years old, they’ll take 2 of these tasty little USDA-certified gummies a day. This particular multi has vegetarian-friendly omega 3s that come from flaxseed oil as well as vitamin D3, B, zinc and more. Multivitamin plus probiotic and Omega 3s. A little tough to chew. Not quite as soft as expected. 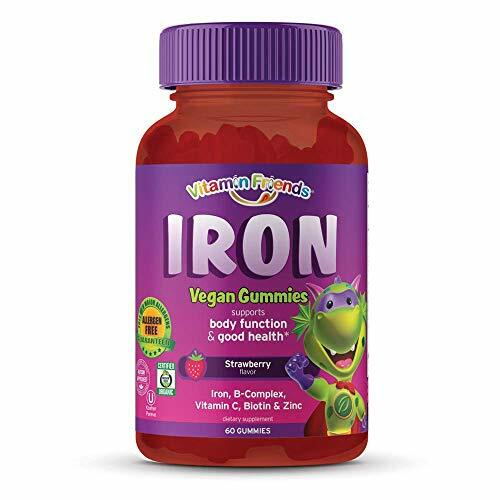 If your child is in need of a little boost in iron, these gummies make taking iron simple and safe. This allergen-free supplement is vegan, kosher and is autism-approved by the Autism Hope Alliance. Iron supplements can be hard on stomachs, but these strawberry flavored gummies are gentle on kids’ sensitive tummies. One gummy contains only 2 grams of sugar and has 15mg of Ferrous Fumarate iron(5mg of elemental iron). Not only does it have iron though, but it also contains beta carotene, Vitamin C, B3, B6, B12, B5 as well as zinc, folic acid, and biotin. Also contains B vitamins, vitamin c and more. Vegan, kosher and free of allergens. Many kids didn’t love the taste. Q: What age can kids start taking a multivitamin? A: Some of the vitamins on our list are safe for kids as young as 2 years old, but check with your doctor first to make sure your child needs and is ready to incorporate a multivitamin into their diet. Q: What exactly is the USP symbol on the label? The ingredients that are on the label, as well as the amounts and potency, are all accurate. The supplement will break down and be absorbed in the amount of time the company specifies. It does not contain harmful contaminants. The supplement has been manufactured according to FDA’s current Good Manufacturing Practices. Q: Why do gummy multivitamins not contain iron? A: Gummy multivitamins are a great way for kids to take their vitamins, but if your child needs iron, they’ll need to take a multivitamin via another means or the iron separately. Why? Simply put, iron tastes bad. Q: What’s the difference between a vitamin and a mineral? A: Most multivitamins don’t just contain vitamins. They contain minerals as well. But what’s the difference? Vitamins are an organic substance means they come straight from plants and animals, whereas minerals are inorganic substances that are in water and soil that get ingested by animals or absorbed by plants. Both vitamins and minerals, however, are micronutrients which simply means that they are only needed in small amounts. Q: My child took too many multivitamin gummies! What should I do? A: If your child took too many multivitamins that contain NO iron, they will probably experience some GI problems such as nausea or diarrhea. Make sure your child stays hydrated. However, if their GI problems get worse or they get sluggish or start acting unusual, seek medical care immediately. If your child took too many vitamins that contained iron, call the National Capital Poison Center immediately at 1-800-222-1222. They will direct you on how to treat your child and notify the nearest emergency center so your child is treated immediately upon arrival. In some cases, they will send an ambulance. To prevent this, be sure to keep all vitamins out of reach of children and if possible, lock up multivitamins that contain iron. 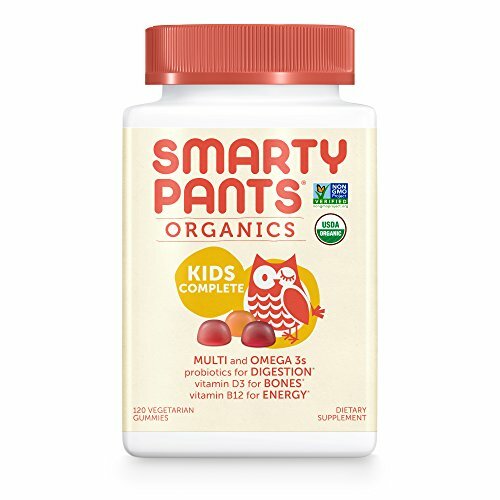 If you are looking for a great do-it-all vitamin to help fill in the nutritional gaps of your child’s diet, then the Smarty Pants Organic Kids Complete will certainly complete their daily requirements of the 14 essential vitamins and minerals they need as well as a probiotic and omega 3s. They taste great too, so kids will enjoy taking their vitamins, which means one less battle for you.